All farmers hope to increase the yields of their harvests. To do this, it is important to keep the crops raised off of the soil using horticultural netting to support them. 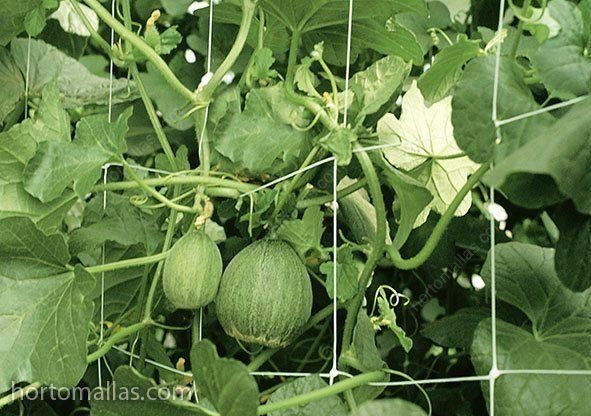 Enabling the plant to grow vertically and away from the soil with HORTOMALLAS trellis netting increases the number of flowers produced (none get trampled underfoot), and by keeping the plant upright the pollination percentage increases as well. HORTOMALLAS support netting works equally well in greenhouses, under shade netting and for protected crops in anti-aphid houses. Tutoring crops is essential to get a good farming results. 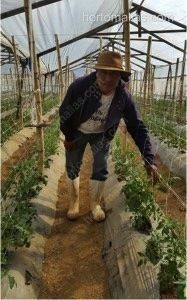 HORTOMALLAS vegetable support netting is used in double rows when tutoring tomatoes, thereby reducing the mechanical stress and the subsequent loss of crops from the manual transmissions of plant pathogens. Tutoring with HORTOMALLAS increases the ventilation and sun exposure of the vegetable plants. A vegetable plant that is lifted up and held in an upright position will have less risk of fungal pathogens that are caused by excess moisture. Additionally, as the stems are not damaged when workers walk between the furrows, the number of possible entry points for a disease are reduced. As they grow lifted up from the ground thanks to the support netting, the plant will not be as susceptible to microbials such as mildew and other fungi. Better plant health means less need for agrochemicals and the possibility of producing organic crops which are better paid in the current market. HORTOMALLAS vegetable support netting offers cultural and financial benefits to a farmer who has previously relied on raffia. 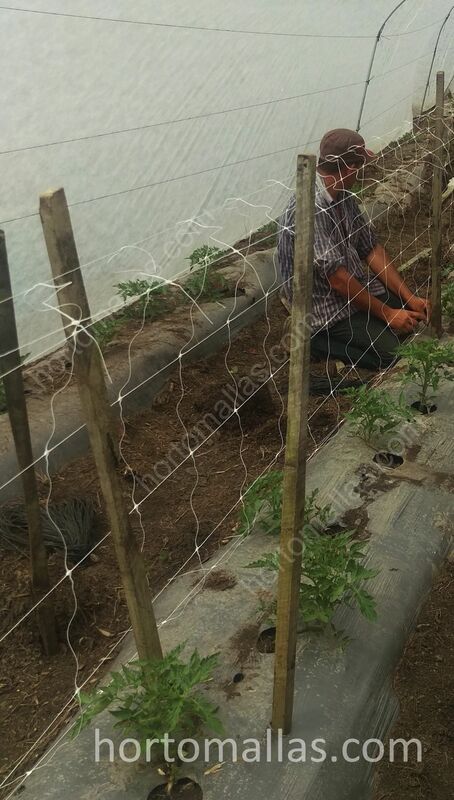 As regards solanceae, HORTOMALLAS is preferably installed along both sides of the vegetable crop (installing it is very quick and easy, requiring 25% of the manpower needed to install a raffia tutoring system). This reduces the amount of manual contact required with the plants during the tutoring process compared to using raffia which unavoidably brings the plants into contact with farm workers every week during vegetation growth stages. 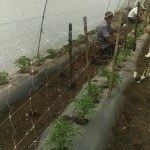 A double walled system of horticultural netting, used with tomatoes, peppers and chillies, helps to control the spread of plant pathogens as it cuts down on how often the farm workers have to touch the plants during the tutoring stages. Reducing mechanical stress increases the crop’s productivity. With cucurbits, just a single layer or wall of HORTOMALLAS is required as these plant species are natural climbers thanks to their tendrils. HORTOMALLAS gives them a natural support that allows them to grow and blossom more effectively.